Designing Christmas cards is fun...but designing birth announcements is extra fun! Once again, I used Tiny Prints and I couldn't be happier with the results. My biggest struggle was (and always is) choosing a photo. No joke, I agonized over it for daaaaays. Why?? I don't know, no one cares quite like me. One thing I like about Tiny Prints, however, is the ability to include multiple photos and not just on the announcement itself! 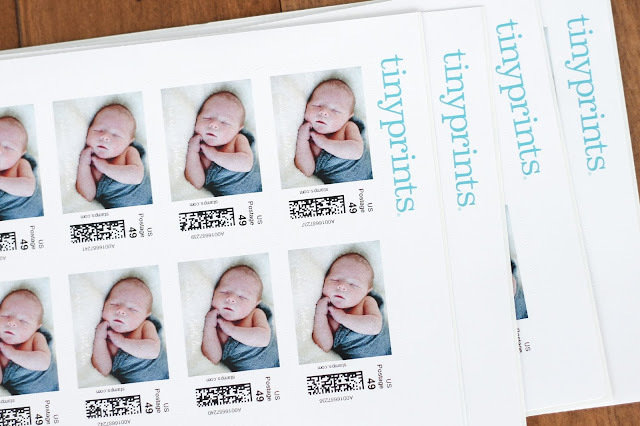 I decided to include an envelope liner with a photo and I also ordered personalized stamps. Yep, that baby you see on the stamp--not just a random baby, but that is our very own Rhett! So fun, right?! 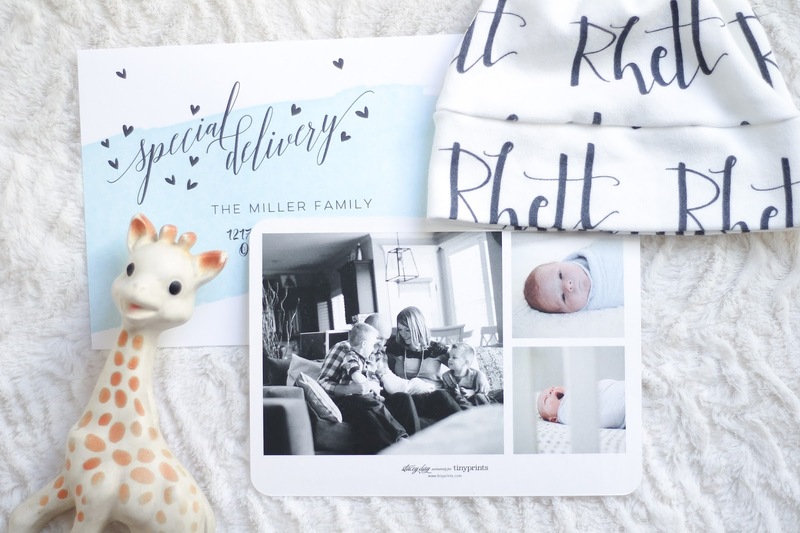 I also added three photos to the back of the announcement so I feel pretty good about getting to show off six of his most precious newborn photos. As for the announcement itself, once again, I struggled to choose a design, but decided upon the foil-stamped because - shiny gold, duh! I also took the time to type our friends' and families' addresses into Tiny Prints so I could have them printed on the envelopes and that may have been the best decision ever! *Disclosure: This post is sponsored by Tiny Prints, but all opinions are all my own. Squishy baby announcements just get me! You chose a great one! 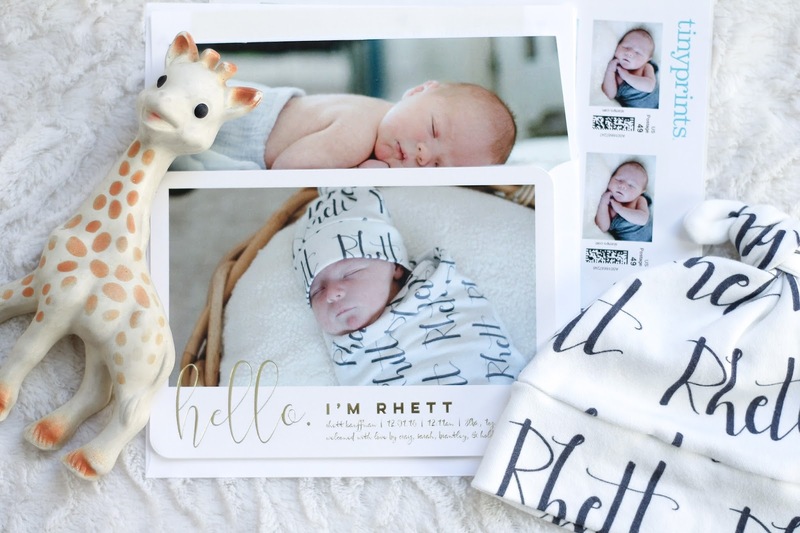 Oh sweet Rhett! These are so precious! And the details...perfect!! Can you please just send me something so I can have that stamp? OH EMM GEEEE! How friggin' adorable? L.O.V.E. the announcement. It's SO perfect. And, solid choice on the stamps (amazing) and having the addresses done by TP. When I saw the title of your post my first thought was “how in the world did she choose photos out of the thousands of adorable ones she has taken? ?” They came out so great!! Just precious, friend. What beautiful cards! But then again, Rhett is a beautiful baby! Those personalized stamps are amazing. I'm IN LOVE with these!!!! They are so, so cute! Can't wait to get mine in the mail! In fact, I better go check and see if it's here now! Gorgeous announcement!! I LOVE the stamp!